Proper Tooth Brushing Techniques are very important to maintain Oral Health, by following correct tooth brushing technique you will be able to remove food debris and plaque which will in turn prevent the onset of Dental Caries. The main reason for Dental caries is food lodgement in teeth, which are the food for the Bacteria and Microorganisms residing in the Oral cavity. The microorganisms consume the food lodged and then produce acid which lead to the demineralization of the Enamel leading to onset of Dental caries. Here we are going to explain in detail the various brushing techniques which are used in certain dental conditions, like the List of Brushing Techniques used in Periodontal Diseases. So in certain Dental conditions some types of Brushing techniques are indicated and some are strictly contra indicated. It is the most commonly used method in brushing, where the Bristles are activated in gentle, horizontal scrubbing motion. Method/Technique: The Brush is Places on the Teeth either on Left or Right Side and the brush in moved along the line of dentition to the posterior region and pulled back again. Advantages/Disadvantages: This method of tooth brushing is used by everyone and this is not beneficial on the long run as Cervical Abrasion is caused mainly due to this type of brushing for long duration. It is one of the most effective Brushing techniqes because of its property to remove plaque or Bio Film and clean the Area directly beneath the Gingival margin which helps in controlling Periodontal infections. Indications of Bass/Sulcular technique: For Open proxinal areas, Cleaning of Cervial areas Beneath the height of contour of Enamel, in case of teeth with exposed root surface. Similar to Bass technique with a slight modification to remove debris more effectively from the embrasures. Bristles are directed apically and angles same as bass, Bristles are placed partly over cervical part of tooth and partly on adjacent gingiva. Indications: In case of Gingival Recession, for Gingival stimulation, to clean from large embrasures, remove plaque and biofilm from cervical region. It is a technique used mostly in presence of any appliances in the oral cavity, it effectively cleans the interproximal areas between teeth. Method/Technique: Position the Bristles towards the Occlusal or Crown of the tooth > The sides of the Bristles are placed at the gingival margin at 45 degrees to long axis of tooth. Short back and forth strokes are given mostly like Vibratory motion. Indications: Effective cleaning of nterproximal areas, Used in case of Fixed Prosthodontic appliances and Charters brushing technique is used in case of patient undergoing Orthodontic treatment. 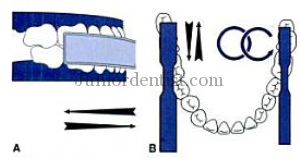 Charters Technique is used in patients with: Orthodontic and fixed prosthetic appliances, patients who have just undergone periodontal surgery for temporary cleaning of surgical site. These techniques are very simple to Understad if you know the 3 main Tooth brushing techniques – Bass, Stillman and Charter’s all you have to do is follow thee technique and at the end Roll the Brush tufts Occlusally towards the crown. Method/Technique: Follow the Tecniques mentioned above about the 3 techniquesCharter’s, Stillman’s or Bass and at the end of each technique Rool the brushes towards the occlusal surface of the teeth, roll tufts occlusally after cervical area is cleaned by prescribed method. This will help is clearing out the debris, biofilm out of the Embrasures. Indications: Clean entire facial/buccal and lingual surfaces, Rolling motion avoids damaging the base of the gingival sulcus. It is the simplest of all methods of Brushing, all you have to do is move the Brush in a circular motion around a set of teeth and move on to the next set, it is useful in teaching Children to Brush. But the down side is, it is the least effective brushing technique. 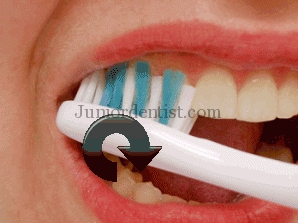 Method/Technique: Place the Tooth Brush on a set of teeth, then activate the bristles by slightly pressing them against the teeth and give circular motion motion 4-5 times on each set of teeth and move on to the next set. Indications: Its mostly indicated for children but it can also be applied to adults. It is a simple technique but it has shown to be less effective then the three first methods. This is another very simple brushing technique which dose not need much practicing, all you have to do is place the bristles on the Gingiva towards the root and give a upward stroke towards the occlusal surface. Method/Technique: The Bristles are pointed apical towards the root and placed on the Gingival margin and then a stroke is given to roll the Brush occlusally cleaning the interproximal and the tooth surface in one stroke. Indications: Used mostly in addition to Bass, Stillman’s and Charter’s techniques where we give this roll stroke at the end of each such technique. Following the proper Tooth brushing techniques is useful in maintaining your oral hygiene, as your dentist for the preferred Tooth brushing technique for your oral cavity. The brushing techniques required for each patient is different and it is important to get the information from your dentist before you pick a particular brushing technique. Great! So helpful! Thank you! Thank you for sharing the different types of tooth brushing techniques. I think everyone would like healthy teeth and a nice smile. There are certain things that we must do such as brushing our teeth, flossing, and eating healthy food. Like you said, “bass method or sulcular brushing technique is one of the most effective brushing techniques because of its property to remove plaque.” We should all remember to brush properly and for the right amount of time. Thanks! Thank you very much,this was very helpful for my assignment. Thank you very much. It’s really helpful. Thanks Doc. Keep up the good work. thank you verry much for your info..
Education demands insight as to the rationale for recommended technique . Failure to advise brushing is compensation for lack of chewing demanded by a primitive diet, causes brushing that fails to imitate the chewing motion. Vertical brushing is what meets our natural requirements and this must be explained to our patients. Good work. More oil to ur eldow. very encouraging keep doing the work. Dental therapist nigeria gombe state. This really gives a good insight of types of brushing. I have one doubt regarding fall of milk teeth for children. For my kid of age 11 still 2-3 milk tooth are present , which are becoming obstacle for the permanent teeth. they are so strong. How should i come over with this problem. One doctor told to get it operated (means to remove tooth which will be very painful). Is that the final solution. Can I get any good government dental hospital in hyderabad. The problem you are talking about is Over retained Deciduous teeth, which can become a problem for the proper eruption of permanent teeth. If these teeth do not go on their own they need to be removed. It is a slightly painful procedure, administration of LA is the only part where your child will feel pain. Thanks a lot! Very much appreciated!! helps me in my last minute exam prep! Very sad that instruction is given without rationale. Surely, critical information on brushing, as substitute for mastication of primitive diet, necessitates an absolute requirement of imitation of the chewing motion? Such simple explanation must allow greater potential for beneficial brushing! Rationale of every brushing technique is mentioned in the Technique or under Indications. Please point out where we have missed them, so they can be updated in the post. Thanks in advance. May I please point to the fact that primitive man had no tooth-brushing occurring but hours of masticating primitive diet allowed avoidance of dental diseases. I believe, imitation of the chewing motion is then empowered, when brushing with an appropriate brush using length of brush head for outside surfaces and width for lingual surfaces. Your opinion is valued! Which is better – Own Dental Clinic or Working at Corporate hospital?